Schiaparelli dresses, from 1934 on the left, 1938 on the right. So I’m standing inside one of the galleries at the Met during the press preview for the exhibit Schiaparelli and Prada: Impossible Conversations, taking pictures of Schiaparelli evening dresses from the 1930s when I glance to my right and see Bill Cunningham, the New York Times street style photographer, documenting a cluster of dresses next to the ones I was shooting. It’s always a thrill to see Bill and I decided to be smart and mildly shadow him to see if I could pick up any photography tips just by watching him work. This may be old hat to you shutterbugs but it’s news to me since I consider myself a writer first, photographer second. Clothes are sensitive to light, which is why regular museum-goers are not allowed to take photographs in costume exhibits at the Met (and the guards will yell at you if you do, or even toss you out, as I once witnessed). The curators don’t want the garments exposed to the light of many flashbulbs over a period of a couple of months. At most press previews I attend flash is NOT used by the professional photographers. You will see it used by video cameramen (in the form of a steady bright light) but many of the still photographers, some of whom even work for the New York Times as Bill does, don’t use flash, so I got used to not using it either. Bill, however, used flash, in every shot throughout the exhibit. I tried shots without it, and then with it, and it was very interesting to see the difference in the results. Without the flash, I got more of a feel of the exhibit itself, and the experience of being in it. With the flash, it’s all about the clothes—the details and the color of the garments come to life. Without flash. You get more of a sense of the exhibit than the dress. With flash. The colors of the dress (and the mannequin head) stand out. When I was standing with everyone else in the European Sculpture Court listening to the remarks given by Thomas P. Campbell, the Met’s Director, Harold Koda, Curator in Charge of the Costume Institute, and Andrew Bolton, Curator, the Costume Institute, a flash of blue caught my eye. It was Bill, in his trademark blue smock, slowly working his way through the crowd, stopping here and there to take pictures of media people in the audience. He was the only one walking around and he didn’t rush, he moved through at a deliberately slow pace, camera at the ready. After the remarks he asked one woman in particular to stop for a picture. 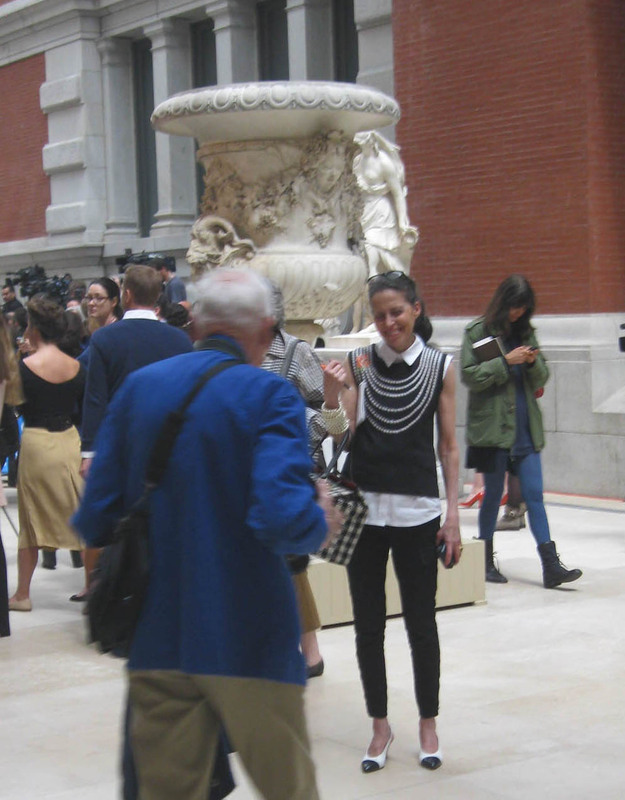 She wore a black trompe l’oeil sweater with strands of pearls woven into the design. Schiaparelli got her start in fashion making trompe l’oeil sweaters in the early 1930s and I’m convinced that because Bill saw one of those sweaters in the exhibit he couldn’t resist taking a photograph of the only woman in the room wearing one herself. Schiaparelli sweaters from the 1930s. I wish I owned the one on the right. Maybe you’ll see this lady in a future “On the Street” feature on the New York Times website. Remember you saw her here first! I love this post, Jill, and I learned from it. I am also a writer first and a very neophyte photographer. You were so wise to shadow him. I also love the look of the lady he is walking towards!! The first two dresses in the museum are gorgeous!! I can see the difference without and with the flash. As a media photographer, he must receive special permission to use flash. I know at times that I've tried to use a longer exposure...with mixed success as it means holding the camera very still. I loved this glimpse of Bill's working methods. Thanks for sharing your tips Jill! Great post! I'd love to read these kind of posts over at IFB LALM, which I've become quite frankly bored out of my head at. Anyhoo. Loved the tips, love Bill!